Looking for the show stopper? Something that catches the customers eye, if even only for a second? Then we have just the right thing for you and your business. 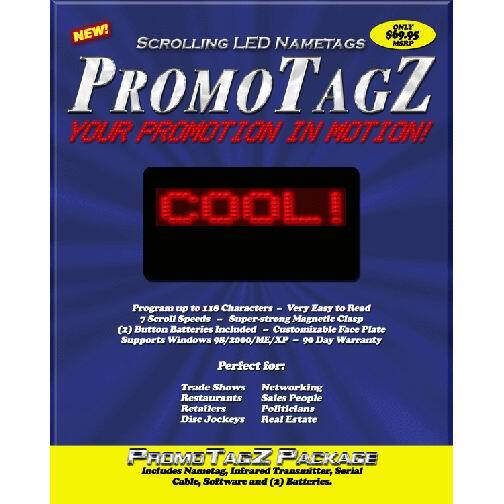 An electronic name tag that will not only catch the customers eye and stop them, but will promote your name and product with up to four different scrolling messages of up to 118 characters in length. 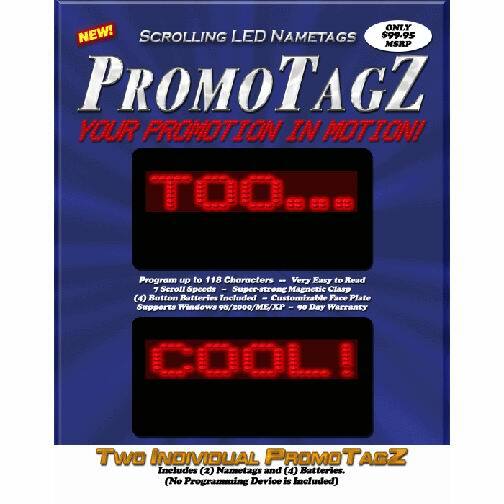 There are literally hundreds of uses for the PromoTagZ. 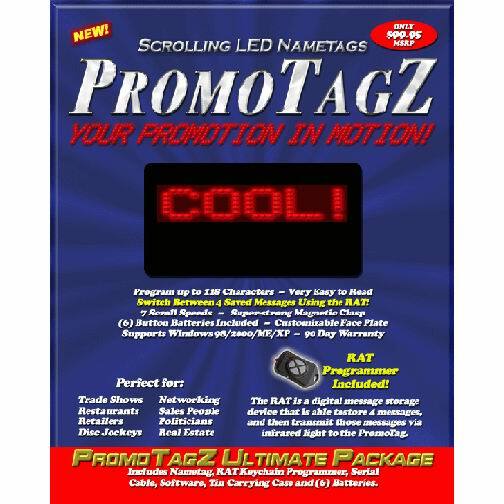 It's perfect for retailers, restaurants, trade shows, network marketing, sales people, plitical campaigns and promoting the item with the highest profit margin. Once programmed you can change the messages at will via infrared light cable on your computer, or via a RAT. The RAT is a key chain storage device capable of storing up to four messages and changing the display of the scrolling LED badge even while you wear the badge! We have three different packages to choose from. Large 3 1/8" x 2 1/16"
Mini 2 1/4" x 1 1/4"
System Requirements: Windows 98 or above and working 9 pin serial cable port. Note: This package does not include the programming kit and RAT Remote. way of getting two additional badges. Copyright ?2004 by Terry G. G. Salomonson. All rights reserved. Printed in the United States Of America. No part of this publication may be reproduced, stored in a retrieval system, or transmitted in any form, or by any means, electronic, mechanical, photocopying, recording, or otherwise, without the prior written permission of the author.